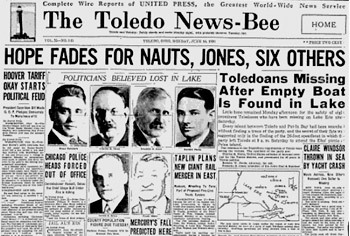 On a hot Saturday morning in June, 1930, eight Toledoans set out on a speedboat to attend an Elks picnic on Pelee Island and never made it. When the boat was found, empty, about 7:30 p.m. later that Saturday, June 14, it presented several mysteries to the people searching western Lake Erie: the ignition switch was on, the boat was in forward gear, and the throttle was wide open. The two rear gasoline tanks were empty but the front auxiliary tank was full. Glass on both sides of the windshields had been shattered, and the rudder was bent. Plus, there was the bacon. Frank Miller, heating engineer, former superintentent of the city water works and former councilman. Also missing were John (Rib) Meyers, the speedboat owner, and John Liptak (also reported as Lipzgach early on), the pilot. Experienced boaters said they believed the damage indicated the boat had probably struck something at high speed and ejected its passengers. By the time Tuesday’s News-Bee, at right, hit the streets, this less plausible theory had gained quite a bit of credence. Walter Nauts, son of Charles, told the News-Bee he received information secretly that day that his father, brother and other members of the party had been kidnapped. The information came to him from a Cleveland source and he had every reason to believe it reliable. 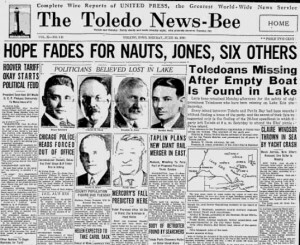 This revelation unleashed a flurry of activity as “an army of prohibition agents, coast guardsmen, deputy sheriffs, policemen and private citizens decended at noon Tuesday upon a rumrunner’s rendezvous at the mouth of Ward’s Canal, Bono, O., where they hoped to find, alive, the eight Toledoans missing on Lake Erie on Saturday,” according to the News-Bee. The belief was furthered by the discovery by a search ship of a shirt with the initials H.W.N. tied to a life preserver. Meanwhile, veteran boatsmen at Put-in Bay maintained the entire group had drowned, probably when the boat hit a fishing net and ejected its occupants. They were probably right. The following day, after the body of pilot Liptak was found by the Coast Guard, the focus turned to finding the other victims. A week later, the second victim was found when the body of Henry Hainbuch was found four miles south of West Sister Island. That same day, five more bodies were found. The last body, that of Charles Nauts, was found ten days after the accident. 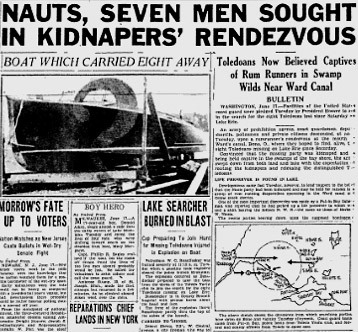 boat was found right side up,all eight drown drown.i don’t believe it was an accident.i think they met with fowl play.purple gang or licavoli.